Welcome to the July 2015 Newsletter! A short list for this July but enough for reading all the month. Among the selection, please have a specific eye on American Neon Signs, a superb book of photographs by Toon Michiels, Hurban-Vortex: three series on Japan of overprinted photographs by Boris Wilensky, and The Ghosts of Ellis Island which depicts the project by JR in 2014. 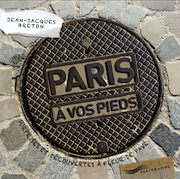 Summer being an excellent season to walk around the streets of the city, our back list item is Paris à vos pieds a short study dedicated to the different manhole covers you can find on the sidewalks of Paris. Photographs of neon signs by Toon Michiels. Three series on Japan by French photographer Boris Wilensky. Short study dedicated to what one can find on the sidewalks of Paris. By Ashley Routson, the "craft beer evangelist". Study didcated to book covers during the Weimar Republik. Copyright © urban-resources.net - July 2015 - All rights reserved.